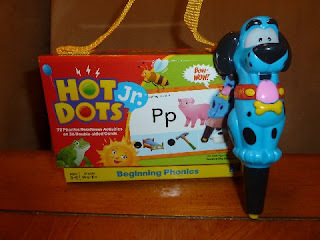 The Lil Divas and I had the opportunity to review Educational Insights Hot Dots Jr. Beginning Phonics Cards and Ace the Talking, Teaching Dog. The Lil Divas and I both really love this product. Ace the Talking, Teaching Dog really makes learning fun - the Lil Divas love playing/learning with him. He was very easy to use - simply press down on your answer and Ace responds with a "correct" or "terrific" and even lights up or wiggles from time to time. If you answer incorrectly he let's you know and encourages you to "try again". 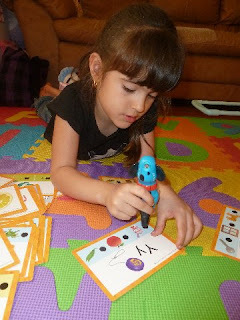 The Lil Divas were able to work with this set independently as it is self-correcting and Ace helps them along. 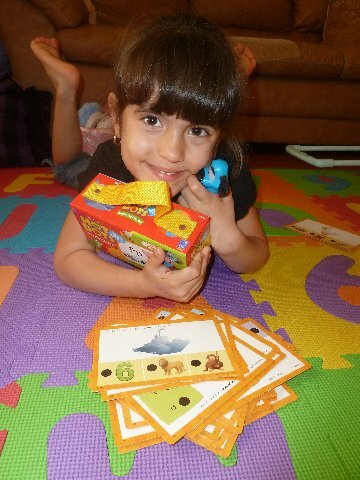 The Beginning Phonics card set was perfect for what I am trying to reinforce with the Lil Divas at home. Both my (almost) 4yr. old & my 5 yr. old really enjoy this set. There are 36 double sided cards offering a total 72 beginner phonics activities which review initial and final sounds and rhyming words. The Lil Divas love the rhyming cards and they love to take it a step furthur and think of additional rhyming words on their own! As both a Mom and a Teacher I found this set to be a great way to reinforce letters and sounds with your beginning reader in a fun and interactive way. The Lil Divas were having so much fun playing with Ace they didn't even realize they were learning/practicing crucial Phonics Skills. They have actually been asking for more cards. There are other Hot Dots Jr. sets available which review, the alphabet, colors, numbers, patterns and shapes. 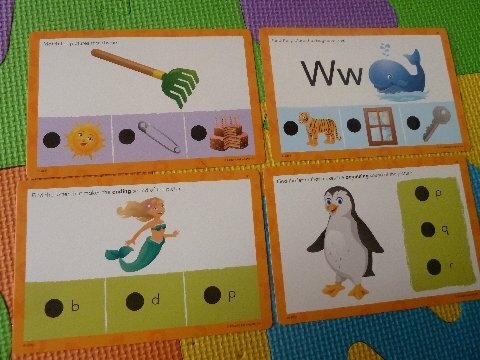 There are also Hot Dots Sets sets for older children - I have my eye on the vowels set becasue that is a concept my oldest Diva is struggling with - that the vowels make 2 sounds! This set would be perfect to practice & reinforce the concept with her in a way I know she will like due to the success of Hots Dots Jr. Overall, The Lil Divas and I give Hot Dots Jr. Beginning Phonics Cards & Ace a big thumbs up and we will definitely be looking into adding more sets to our collection. Buy It: Purchase Hot Dots Jr. Cards and Ace at Educational Insights website and at other local retailers. Win It: Educational Insights has graciously agreed to giveaway an Ace The Talking, Teaching Dog Pen + 1 Hot Dots. Jr. Card Set to one (1) lucky Mom to 2 Posh Lil Divas Reader! Visit Educational Insights and tell me which other product you would like to try! Disclaimer:I received a Hot Dots Jr. Begnning Phonics Crad Set & Ace Pen for the pruposes of trying them out for this review. That being said, this review is my 100% honest opinion of this product - I am not paid for my reviews or optinions! They are 100% mine! Please remember that your opinions and tastes might differ from mine. That looks like fun. I would also like to try WINGO, anything to get these kids learning in a fun way! Great Giveaway! I would love to try GeoSafari® Jr.® Bug Scene Investigator also! My family would really enjoy the Alpha Catch game. I would also like to try the playfoam! looks like fun!! I would want the Design & Drill- my boys would love it! And play foam for my little lady! Love the GeoSafari Talking Globe. follow you via GFC under AEK. The Design and Drill looks like it would keep my kids busy for hours! The site has so many great items, thanks for bringing it to my attention. Lead me, I am now your follower. I would like to try the Geosafari® Vega 360 Telescope! I love the talking globe! It has been something on my wishlist for a year now! I follow EI on FB too! My 5 year old has been asking for a telescope,and would LOVE the Geosafari Vega 360 Telescope! I really like the alphabet/color/shapes bean bags. Those are cool. I like EI on FB. I also suscribed by email. The post above should say I follow your twitter. haha, sorry about that. We would love to spend $1000s at this website. We would love to have all the Hot Dot products as I have kids through Grade 5 right now. We have an email sub. I have my eye on the Shapes Up! Game on the Educational Insights site. Following Mom to 2 Posh Lil Divas on Facebook. I subscribe to your emails. And by the way, on my last comment I meant Twitter, not Facebook. The Design and Drill would be so cool. We like the PlayBrix™ Cardboard Building Bricks, Set of 54 Assorted. I really like the Design & Drill™ Activity Center. My boys would love it. I left a comment on the cloud post. I would also like to try the Numbers Count games. I found my daughter learns so much faster when I make learning fun!